RET Physical Therapy has provided a successful aquatic physical therapy and rehabilitation program at the Aquatic Therapy Center at Mercer Island since 1987. Our experienced therapists have developed specialized and individualized programs that take advantage of the many benefits of warm water therapy. Aquatic Physical Therapy allows people of all ages and levels of function to reach their goals, and return to what they love to do. For those with difficulty moving, water offers gentleness that provides reduced stress on joints and muscles; great for post-operative joint replacements. For strengthening and balance, water’s resistance can develop the conditioning necessary to return a seasoned athlete back to their sport. It also gives confidence back to those who want to return to a more active lifestyle. Unique to the Seattle/Eastside region, our aquatic physical therapy pool offers a combination of a warm water environment, as well as both shallow and deep ends. Shallow water allows successful treatment, even for those that are not comfortable with swimming. If using the deep water is possible, this environment can reduce compression on joints and assist greater muscle relaxation. To schedule an appointment or for questions, call 206-230-9613. 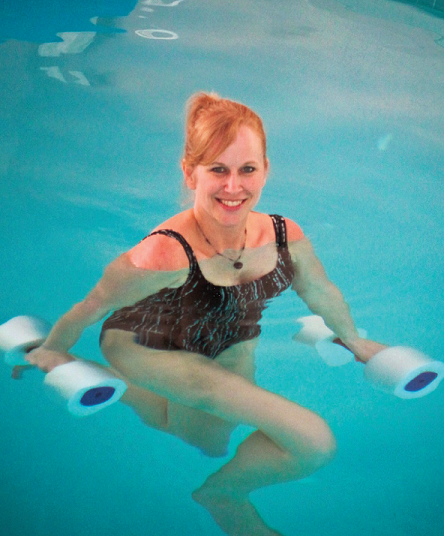 Does my insurance cover aquatic therapy? Most insurances cover aquatic therapy. We can help with the process, but you will receive the most accurate information by contacting your insurance company directly. What is the temperature of the pool? Is it chlorinated? Do I need to get my head (ears, eyes, nose, hair) wet? The aquatic therapy pool has both deep and shallow ends. Typically there is no need to submerge or get your head wet. We do not have a lift. There are 4 steps to enter/exit the pool. A handrail is on the left when entering and right when exiting. How long is an aquatic therapy appointment? Appointments are normally scheduled for one hour. Please arrive early to allow time for changing, entering/exiting the water. Bring a towel and your swim suit. Aqua shoes/socks are recommended but not necessary.